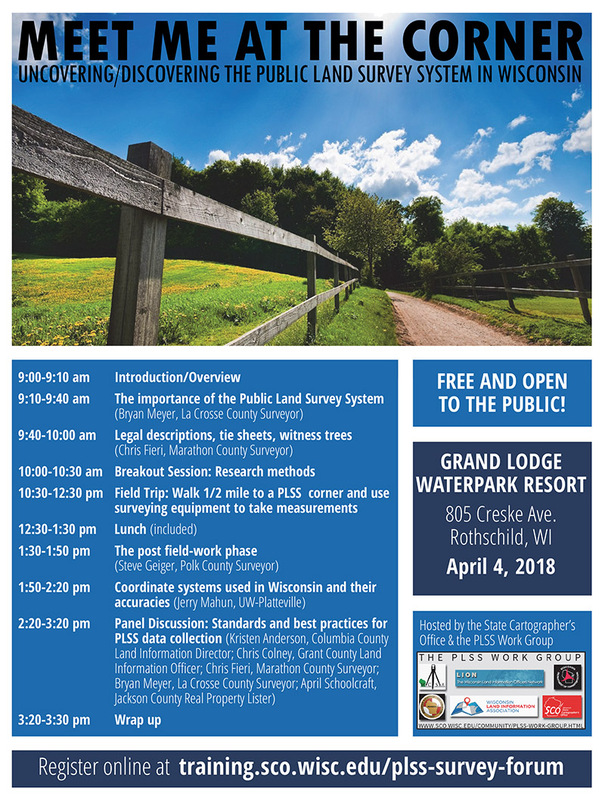 There is s till time to register for the Public Land Survey System (PLSS) Forum “Meet me at the Corner” scheduled for Wednesday, April 4th at the Grand Lodge Waterpark Resort in Rothschild, WI. So far, over 50 attendees have registered to participate in this “free” one-day event to learn about the Public Land Survey System, legal descriptions, tie sheets, coordinate systems, and hear a panel discussion on standards and best practices for PLSS data collection. This forum also includes a field trip where attendees will walk a few blocks to a PLSS corner and use surveying equipment to take measurements. The forum will be hosted by the State Cartographer’s Office and the PLSS Workgroup. Please feel free to contact either Howard Veregin (veregin@wisc.edu) or Brenda Hemstead (hemstead@wisc.edu) if you have any questions.